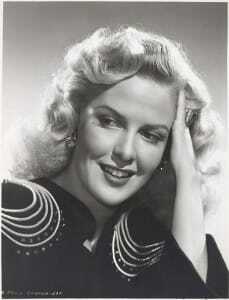 Janis Carter was born Janis Dremann on October 10, 1913 in Cleveland, Ohio. After graduating with two degrees (Arts and Music) from Mather College (Western Reserve) in Cleveland in 1935, Janis headed to New York with aspirations of embarking on a musical career in opera. Supporting herself by waitressing, singing in churches, modeling (Conover) and writing radio scripts, an audition with the Met came along. However, a case of nerves assured her failure and an end to that ambition. Landing on her feet, she got a part in the Broadway musical, “I Married An Angel”. “DuBarry Was A Lady” soon followed and then “Panama Hattie” in which she had a solo number. Darryl Zanuck of 20th Century Fox attended the opening night and was impressed enough with Janis to offer her a contract. She arrived in Hollywood in February, 1941, and stayed for 12 years making more than 30 movies for 20th Century Fox, MGM, Columbia, and RKO. She appeared in the films “Night Editor” (1946) and “Framed” (1947) with Glenn Ford and the “Flying Leathernecks” (1951) with John Wayne. She was married to Carl Prager from 1942 to 1951, but divorced him. After leaving Hollywood for good, Janis headed back to New York and began a career working in television. She acted in numerous shows, both drama and comedy, and in 1954 became the hostess of the NBC quiz show, “Feather Your Nest”, working with Bud Collyer. In 1956, Janis married Julius Stulman and retired from show business. They remained together until her death. With the same enthusiasm she had shown in other areas of her life, she involved herself in cultural activities of her community serving in various capacities throughout the years, primarily in Sarasota, Florida. She died from a heart attack, on July 30, 1994, aged 80, in Durham, North Carolina. 1936 – ? Models as a Conover Girl and is one of the first ten models to sign with the new John Robert Powers Agency in New York. 1938 is in advertisements for Raleigh cigarettes and Ipana Toothpaste. Chosen “1946 Motion Picture Sweater Girl” at the National Knitted Outerwear Association convention in New York City.